The BFREE Science and Education Fellowship Program is a two-year commitment which offers training and research opportunities to recent graduates of Universities and Junior Colleges in Belize. First-year Fellows will work one-on-one with assigned Mentors at the BFREE Field Station. Second-year Fellows will take on the role of Mentor to help guide incoming program participants. Candidates must have completed a degree at the Junior College or University level, have a strong interest in the conservation of Belize’s natural resources, be committed to a strict work program in a remote rainforest environment, and have strong references from their academic advisors. This is a full-time position (Monday – Friday, some weekend work is required). Fellows receive room and board and a monthly salary. Fellows report to the Deputy Director and work with other BFREE staff as assigned. BFREE is now offering an extraordinary opportunity to learn how a biological research station runs while gaining extensive experience in field methods as a Volunteer Field Assistant! Opportunities are for all ages (18+) and last anywhere from 2 weeks to 3 months. The Belize Foundation for Research & Environmental Education (BFREE) Biological Research Station is located in the foothills of the Maya Mountains on a 1,153 acres privately protected area. Founded in 1995, BFREE’s mission is to conserve the biodiversity and cultural heritage of Belize. We seek to achieve our mission by facilitating scientific research, conducting environmental education programs and through conservation messaging. Hundreds of interns and long-term volunteers have stayed at our tropical field station since its inception. These volunteers have benefited from the unique experience of living and working in the rainforest and have made tremendous contributions to our wildlands conservation programs, environmental research, and education efforts, as well as to the development of our sustainable facilities. BFREE is seeking dedicated and motivated individuals to assist in the care and research of one of the world’s most critically endangered freshwater turtles, Dermatemys mawii. Locally known as the hicatee, this turtle has been hunted to the brink of extinction for its meat and is currently classified as Critically Endangered. This volunteer position will take place at the BFREE Biological Field Station, home to a captive breeding facility for the hicatee, the Hicatee Conservation & Research Center (HCRC). 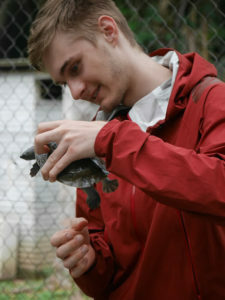 In this immersive opportunity as a Volunteer Field Assistant, you will assist in all aspects of animal care for the captive population of adult turtles, juveniles and hatchlings. As part of the husbandry program, you will participate in collecting food from the wild for the turtles, weekly cleaning and maintenance of hatchling tanks, health checks of the hatchling turtles, monitoring of incubated eggs, associated data collection and photo documentation, routine maintenance of the grounds at the HCRC, and other relevant duties and special projects as assigned. 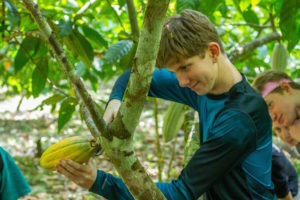 This volunteer position will take place in BFREE’s cacao agroforest and our Cacao Discovery Center (BFREE’s classroom and post-harvest processing center). Under the supervision of the Cacao Farm Manager, work will fall under several categories including: Cacao Nursery Development (planting seedlings, managing plants within the nursery); Agroforest/ Farm Maintenance and Management (structural pruning, grafting, thinning canopy to produce appropriate percentage of light, compost and organic fertilizer methods); Harvest and Post-harvest Processing (collecting cacao pods, fermentation, drying, preparation for shipment); and Geospatial Analysis of the wild cacao farm (work with team to georeference wild cacao trees, data collection, data entry). This is a 12 week (3 months) summer-long program open to a limited number of participants. There are currently two remaining volunteer positions available. These are volunteer positions, Field Assistants pay for their own international airfare and for travel costs from the airport to the BFREE Field Station. A small daily project fee covers lodging, meals, administration and 4×4 transport from the Southern Highway to the BFREE Biological Research Station & privately protected area. Many past students have received funding and/or credit from their host institution to participate. Payment is due 30 days in advance of arrival. All volunteers will also be assigned a schedule to include assisting with general day to day needs around the field station including support within the cacao agroforest, helping with meal preparation and clean-up, assisting with trail maintenance, town runs, and administrative tasks. Duties may change as determined by current needs at the time of your assignment.